I would like to receive occasional information and updates from Large model of BOB - Thames Valley Air Ambulance and jumblebee. 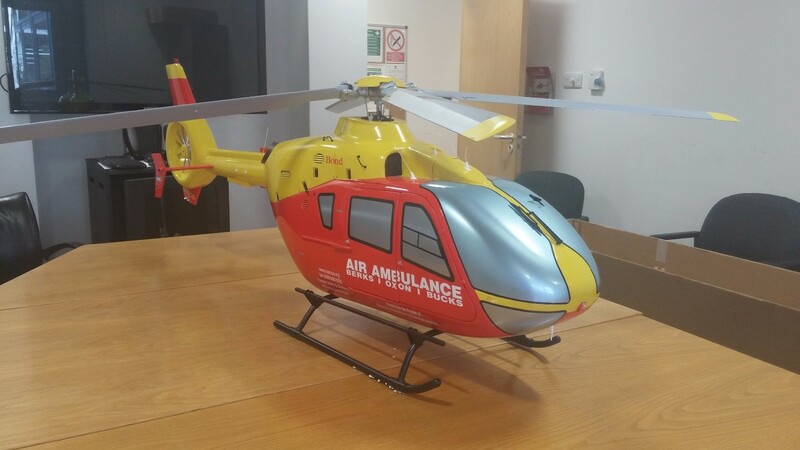 Sadly we are looking for a new home for our model of our old helicopter - BOB. We have had BOB a number of years and used it for a number of fundraising events but now we are choosing to auction it off - all money will go to the life-saving work of Thames Valley Air Ambulance. Over the years the helicopter has picked up some wear and tear which could be fixed to make BOB spick and span. The electric blades do not rotate anymore due to a part of the blade becoming unscrewed. The model helicopter is obviously very large and comes in a huge box so posting is not viable. We can deliver to anywhere within Berkshire, Oxfordshire or Buckinghamshire. Alternatively you can come to our office in High Wycombe to collect. For more information please contact David who will be more than happy to send you more photos and information about BOB. The real BOB was operational from 2008 until 2015 - it saved thousands of people's lives across our region and was affectionately called 'the red and yellow helicopter'. Over it's 8 years in operation you will almost certainly have seen BOB on it's way to a life-saving incident. In 2015 BOB was replaced by our current helicopter - G-TVAL. Much like the real BOB, our model needs to go into early retirement and needs a little bit of TLC from it's new owners.